Saturday, November 5, 2016 was a very special day for father and son Chad and Jacob Skudlarek. Chad was excited about some recent chase activity he had been observing at his cabin on Pine Hill outside of Randolph, NY and the opening of crossbow. As I am getting older I am having difficulty with my old eyes and seeing my bow sight pins well... so the NYS crossbow season was a game changer for me. My son Jacob was in town from Bradford, PA where he works very hard, long days in the oil refinery - ARG. Jacob decided to hunt down the road from the cabin a couple miles and I was making a morning sit in a nice funnel stand near the cabin. After a quiet first hour I heard some crashing and grunting close by. Soon a doe trotted by , tongue hanging out and definitely winded, followed by two spikes grunting and pestering her. Shortly after that a decent 110 class high thick 8-point trotted by, I thought about and even put the crossbow scope on him, but have killed plenty like him and let him walk hoping he would make it another year. On the way in I had laid down a doe in heat scent trail from Randolph's valley view farms and I'll tell you this was a hot batch of scent. Both spikes and the 8-point left the hot doe to bird dog down the scent trail towards my stand before heading back to the doe. This went on for nearly an hour, bucks chasing all around me when another hot doe ran through followed by a four point. It was an awesome morning and I was just smiling and enjoyed the activity. I then felt the phone vibrating and saw I had two missed calls from my son. I called him and he was breathing heavily and very excited. He had just put and arrow from his Mathews through a decent 8-point at 12 yards. He thought it was a little high, but I assured him that was good at such close range from a high stand. I convinced him to sit tight for at least an hour and I would work down and help him. The pack then came back through, went down the hill and I thought it was all over when suddenly they then came back again. The 8-point was again last and again seriously contemplated taking him put passed. As I was lowering the crossbow I saw some movement down the hill and a flash of a definite shooter rack. I quickly ranged the openings I thought he would come through but he dropped down well out of range until he hit the valley view scent trail and swung up towards the stand through a nice lane at around 30 yards away where I made a good clean kill shot. I watched him pile up about 50 yards away and marveled at the power of the crossbow and took a moment to thank our creator for this beautiful day. I called Jacob back and told him, "Sorry, but I had some work to do here and would be there as soon as I took care of my buck." He called back shortly to inform me he had found his, a decent 8-point. 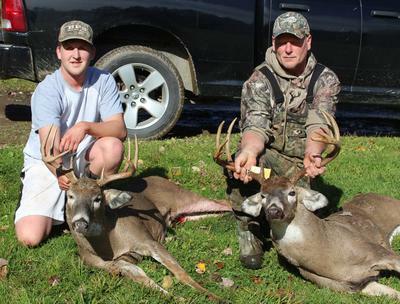 What a morning, a father son double within minutes of each other... a day I will never forget. Jacobs buck was a very nice symmetrical 9-point which was roughed up at 112" and mine was a gnarly old crab clawed 10-point which was green scored at 132.5.